Update 5/1: DMC officially changed its contest policy! We did it! They are now offering a $500 prize and looking into better ways to link to artists’ portfolios. 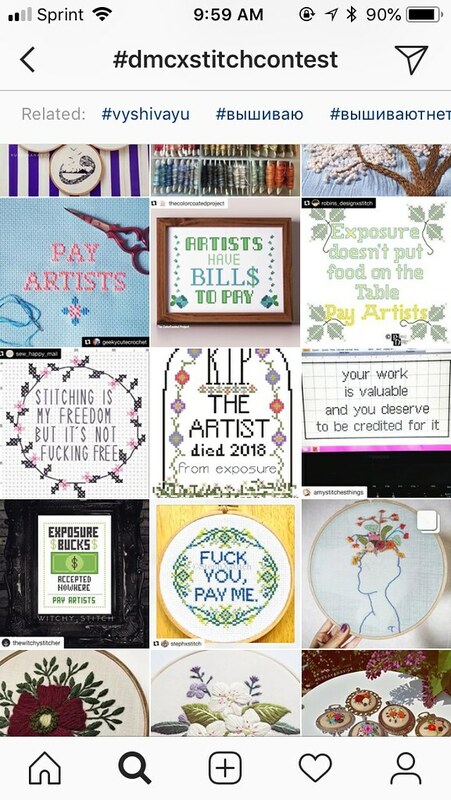 Update 4/30: My designs were featured on the Craft Industry Alliance blog! So work has gotten crazy busy. We’re getting into the end of the semester, so there’s an event every day, and we’re gearing up for graduation. Also, I’m working on a project that I don’t really want to post until it’s finished. Credit for the phrase to Q2Q Comics! I have 4 free patterns in this vein here. Go forth, and create. Share your finished work with me on tumblr or instagram! This entry was posted in Cross stitch and tagged pattern. Bookmark the permalink. I hope you’ll enter it into the contest and use the #dmcxstitchcontest hashtag on Instagram so they’ll see it!